At The Waverly United Methodist Church, we help people discover the awesome power and nature of our great God's love for the world, (Father, Son, and Holy Spirit, Creator, Redeemer and Sustain-er of humankind). We connect people to God, by a three step plan for spiritual growth: KNOW, GROW, and SHOW. KNOW: The Waverly United Methodist Church,primary purpose,is to help people to KNOW, (personally encounter), God's love for them through passionate worship, until worship of our great God becomes our way of life!. 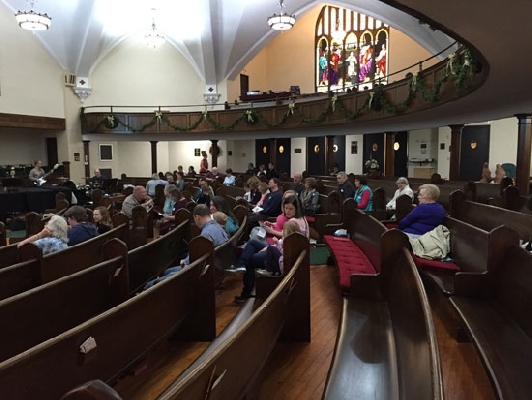 At the Waverly United Methodist Church, we offer gracious hospitality to everyone who joins us for our two Sunday morning services. Though diversified in style, contemporary, and traditional, our worship services, are celebrated for the sole purpose, to glorify God, and connect all people to God's love through Word and Sacrament, the prayers and praise of the people.. Our church throughout the year also offers mid-week services. GROW: We at The Waverly United Methodist Church, GROW in our personal relationship with God, through our understanding of discipleship to Jesus, by intentional small group ministries. Together we learn how to incorporate personal devotion to God, in our daily lives.AT The WAverly United Methodist Church, we offer a variety of small group ministry to people of all ages, to study the bible,,apply it to our daily lives, share our personal journey, and grow together by mutual support and encouragement, in our christian walk. Together in our Wesleyan tradition, of the christian faith, we humbly ask God, to help us grow spiritually, as we ask one another in christian love: Is it well with your soul? SHOW: We at The Waverly United Methodist Church, help one another learn how; TO SHOW THE WORLD,, God's love for humanity. Having come to personally KNOW and GROW, in our relationship to God, through Jesus Christ, as our Savior, and Leader in life, we hear Jesus' claim on our lives, to show Jesus grace' to others, by outreach into our local community and world. Our mission as an United Methodist Church,, is global, as we reach out into the entire world in Jesus' name to make disciples, as we show and share His gracious love to all of humanity. As a local congregation of of The United Methodist Church, we offer outreach ministries, in our Valley, by using our church kitchen to be a "community kitchen," where free fellowship meals, our children and family free summer lunch program in the month of August, benefit meals for community members in need, are regularly offered. We invite community members, as well as our own faith community members, to cook together, share true christian fellowship, and break bread together, as Jesus did in his ministry on earth. In addition, our church offers, adult grief groups to the bereaved in the community, a children and youth grief camp, and Daily Vacation Bible School, one week in the summer. We also offer a mother's support group, and other care taker's support groups, and caring and sharing groups, to help support emotional and spiritual well being, on a regular and rotating basis. Our faith community sponsors Cub Scouting and Girl Scouts. We offer a home, in Christian love, to WIC,(Women, Infant, Children)and TOPS (Take off Pounds Sensibly), to do their important outreach into our community. The Waverly United Methodist Church, is never an independent christian church, but deeply holds the fundamental faith conviction, we as Christians are "better together" at sharing Jesus' grace with the World. We, as United Methodists, affirm the need for ecumenism, and that all human beings are, of sacred worth, and are to be treated with respect and human dignity. Locally,we work in partnership with the Christian ecumenical ministry:The BRIDGE of The Penn York Valley Christian Churches, to provide emergency assistance for those in need in our Valley, as well as share a ministry with several sister churches to provide "Chow for Children," to local impoverished families of preschoolers. All that we do in ministry, in partnership with other christian churches is to share the amazing, redeeming,grace of Jesus Christ' for the peace, protection, and transformation of the world.